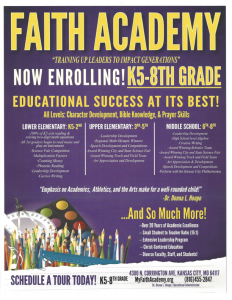 The mission of Faith Academy is to deliver a superior Christian education that supports the development of the child’s total need: academic, spiritual, physical, emotional, and social. To allow Christ Jesus to return to the classrooms. Jesus said, “Suffer the little children to come to me, and do not hinder them, for the kingdom of heaven belongs to such as these.” Matt. 19:14, Without Him, we can do nothing. Children have a hunger for Jesus and are eager to learn. To welcome the presence of the Anointed Teacher – The Holy Spirit. To create a reverence for our Heavenly Father. To train the student in the knowledge of the Son of God (Jesus). To help shape the character of the student to become a (living epistle) true disciple of Christ. To provide a Godly environment for the student to receive a high quality education.